Beautiful Incentives: Beauty Stop Online- Appliances, cosmetics and more-Achieve your perfect holiday style. Beauty Stop Online- Appliances, cosmetics and more-Achieve your perfect holiday style. Are you looking for the next best beauty appliance or hair accessory? With the holidays coming up, we all have important parties or gatherings to attend and we want to look our best right? I'm sure many of you have a specific style in mind and for that you need the right tools. That is where Beauty Stop Online comes in. Beauty Stop Online is just getting started and they have a great selection to offer at the perfect time of the year. From professional grade blow dryers and flat irons, to the latest natural cosmetics and hair trends, they will surely have something to fit your fancy. I know I found a ton of things I would love to receive as a gift. Take for example this steaming flat iron. Normal flat irons don't use the power of steam to straighten hair and do more damage, whereas a steaming iron prevents this. Flat irons can be used to straighten, but what a lot of people don't realize is they make wonderful big bouncy curls. All you do is clamp and carefully twist around each strand to reveal perfect twists. It's an awesome two in one tool! 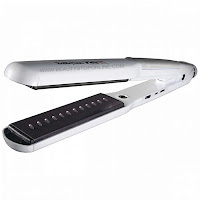 Whatever look you are going for, this straightener will get you there. 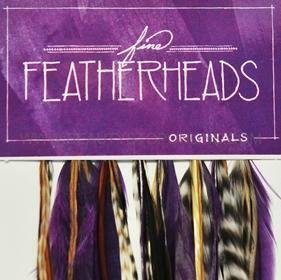 They have unique hair pieces, such as these from Fine Feather Heads. Feather accesories have been very popular this year and I love this look. I have a pair of feather earrings and a necklace and belt to match. A perfect way to really dress up an outfit when you're tired of the same style and want something a little different. How about a new color of nail polish to give the perfect touch to your Holiday Ensemble. Show off your Holiday spirit with a new vibrant red, blue or green nail or combine them all together! Add some shimmer and sparkle to your New Years, with China Glaze's latest shades. Want to get a bottle FREE right now? Just place your order and make sure to put in the special promo code: FREEGLAZE and it's yours! There is a huge selection to choose from, with more arriving every day. Not only do they have competing products, but they have plenty of beauty tutorials, testimonies and reviews to help you achieve that perfect style! Don't miss out on the Holiday Specials running right now, and you can ensure that by keeping up with the latest happenings via their Facebook. Why not make Beauty Stop Online the next stop in your beauty destination? LOVVVEEEE China Glaze I'm in!!! I love the tutorials on their site. I like the tutorials as well! And I soooo need a new flat iron! 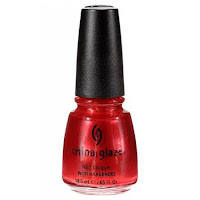 Oh China Glaze is a great reason for me to visit any site. Thanks for sharing. I love china glaze! I love free china glaze even better. There's so great products on this site- thanks! Wow they ave a lot!Thanks for the heads up on a great shop! Great site! 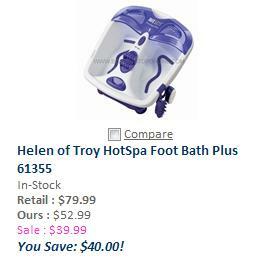 I love that they have deal's pf the day and they have really high end items that I use! THANKS. A foot bath right now would be amazing, followed by my toesies painted. They have a great selection! I am going to do some Christmas shopping through this site! Thanks for sharing! Free China Glaze! I am all over that. There is such a fun selection of great items to choose from. I love the variety of items. My favorite item is China Glaze I can never have enough nail polish. This store could become my new BFF! Awesome site! I love ChinaGlaze too! Thanks for sharing! Great information! Checking out the site...thanks!